We pay hundreds per month for the “convenience” of travelling by Tube into London. There are some of us who travel to the heart of the great city to speak lawyer talk about human rights. Yet surely the most fundamental of all human rights are in breach when, having paid your earnings away to Transport for London, you then find yourself packed so inexorably like a tin of 50% extra free sardines into the coffin-like surrounds of person squeezed upon person, that the right to move, read, sit, stand untouched, even breathe is placed in serious jeopardy. I’ve tried travelling on the tube at all different times, going in earlier, later and in the middle of the rush, just to avoid the humiliating cattle herding onto a train from which i emerge with fresh shirt crumpled, drenched in sweat (both mine and, undoubtedly that of the bloke squeezed in uncomfortably close next to me), gasping to take in air having tried, almost to the point of suffocation, to avoid breathing while enjoying a close encounter with the armpit of a freakishly tall passenger (which always appears to find itself cupping the space around my nose). I’ve even travelled backwards just to come forwards again. But no, it’s the same every day. We are crammed onto these compact capsules, within an inch of our life. 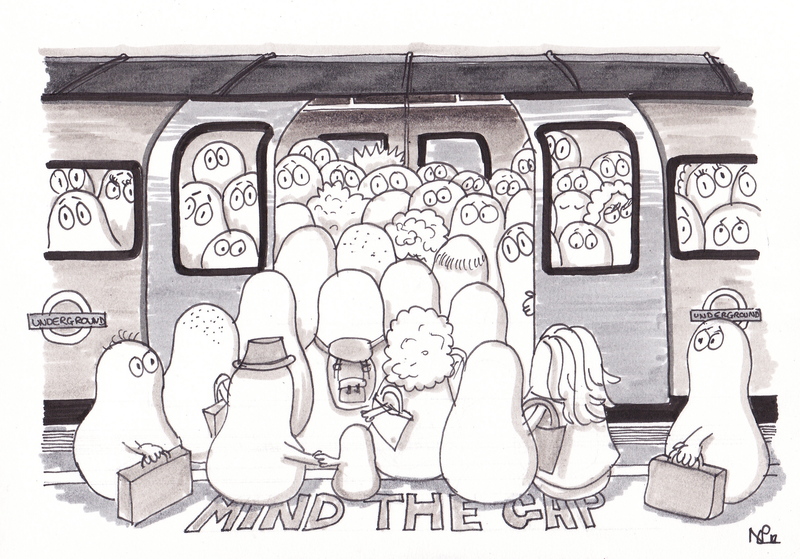 Just when you think no one could possibly squeeze into the carriage, another ten push their way into the crowd, like crowd surfers, incongruous to the consequences for the people they slam their bodies into, so long as they get to work on time. It’s the same in Norm world of course. Except for them things get even worse. The more their round forms squish together, the more their bodies give way to yet more Norms entering the tube carriage until, unavoidably, the crowd of Norms merge into one, unmoving mass of gelatinous substance, so immovably merged together that when the train eventually reaches it’s destination, they can barely move themselves away from the interlocked mass in order to leave. Hmm, now I come to think of it, not worse at all. Welcome to London 2012, home of the olympics. And oh, how I look forward to that.